The instrumentalist argument, in Wright’s view, does not give a plausible account of, among other things, the value of patriotism—of the way Americans revere the Founders, for instance, or love the Declaration of Independence, or idolize Abraham Lincoln. Such political affections cannot be explained by an instrumental common good. Loyalty to one’s country is not like a commitment to a telephone company. As nasty as politics can be, we hope for more from it than the quid pro quo of a business transaction. To arrive at an adequate theoretical account of why that is, Wright brings historical theory from Aristotle to Burke into conversation with contemporary theorists from John Finnis to Amy Gutmann. In A Vindication of Politics he develops a case for the intrinsic value of politics in a way that underwrites a healthy patriotism—and strongly suggests that the political common good is a critical part of what it means to be fully human. 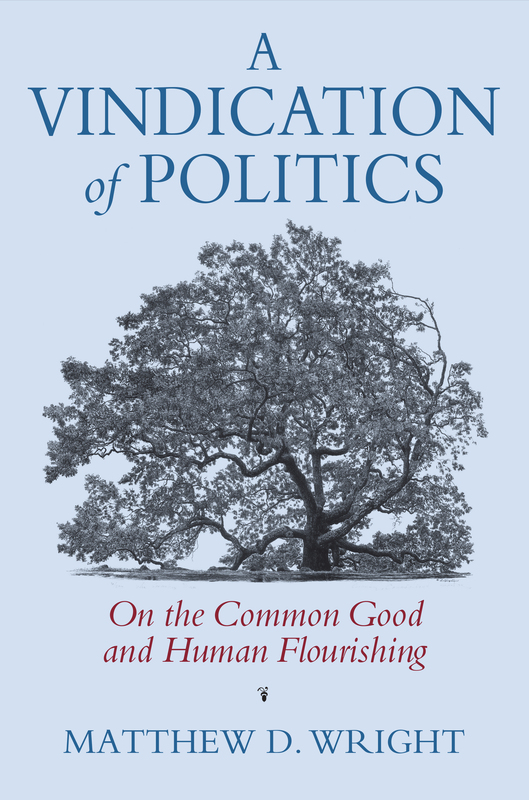 The book offers new insight into the nature of the political common good and human sociability as well as their importance for making sense of the fundamental questions of American constitutional identity, principles, and aspirations. Matthew D. Wright is associate professor of government in the Torrey Honors Institute, Biola University, La Mirada, California.